Instruments with no master / Zoe Lukov, Chief Curator at Faena Art. 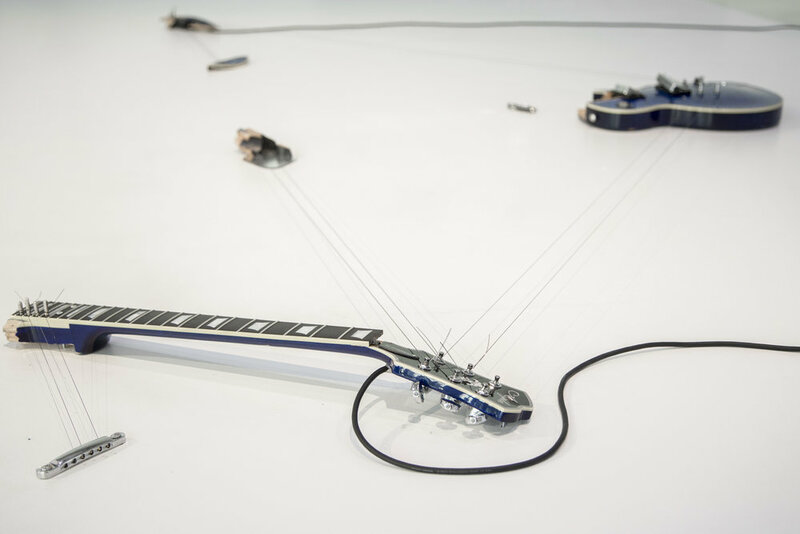 The act of smashing the electric guitar is a thing—a big, climactic, performative macho thing. We have seen it break over and over again, this act of male anarchy and destruction. Its occurrence might have arguably changed rock and roll forever. Pete Townshend of the band, The Who, was the first to break a guitar on stage, but the act has been repeated and memorialized by many great rock and roll musicians from Jimi Hendrix to Kurt Cobain and beyond. Naama Tsabar records the breaks. Melodies of Certain Damage (Opus 2) is her first exhibition in Argentina and her largest-scale installation of this latest body of work, which utilizes broken guitars as prime material for the creation of new sculptural and sonic installations that occupy the in-between, or the hazy area between contemporary art and musical practices—the interstitial zone between object and subject, the amorphous space between performance, process and sculpture. Appropriating this iconic and overtly macho trope, Tsabar breaks guitars, but not for the public – and the act is not the climax but rather the process, the beginning of the creation. The death of the object becomes the starting point of the new project. Melodies of Certain Damage is both a document of her destruction of these guitars and ultimately a proposition for a new kind of instrument, a new sound and way of moving forward for a new creation. She repurposes the remnants of an act of male bravado and violence, reimagining the broken pieces as objects of visual and functional significance. Inserting them back into a new working order, Tsabar makes the remains of what once was, into instruments in their own right. The guitar becomes a relic, denied its previous existence as a reified object within a hegemonic performance structure. The once phallic object, intended to be held and played in a specific way and then ultimately destroyed in one climactic and almost sexually explicit moment, is now a field of shattered pieces, scattered throughout the space, re-strung and tenuously transformed into a new territory for the performers to insert themselves into. The works are maps for the memory of the damage. There is something totemic about the electric guitar destroyed by the artist in a private, ritual sacrifice. A channeling of energy towards the moment of sculptural creation that might be seen like a clearing or a cleansing, or a suggestion for future healings of the individual body and communal social body—out of the wreckage and the violence. The rhizomatic structure of the installation necessitates a shift in the gaze and in perspective—a multiplicity of viewpoints with no centrality. The public can touch the works and move through them—a variation on the communal gathering experience and a new radical and disruptive mode for public engagement with sculpture and sound that inverts the well-established relationships between performer and viewer, between the audience and the venue and ultimately between the object and its activator. It is important to note that in her research, Tsabar has not found one recorded instance of a female musician breaking a guitar—not even an instance where it was written about. This body of work implies a shifting of the record and the record keepers. Her seminal work Untitled (Babies), an ongoing performance that began in 2008, was an early engagement with what this gesture could mean for female-identified performers. 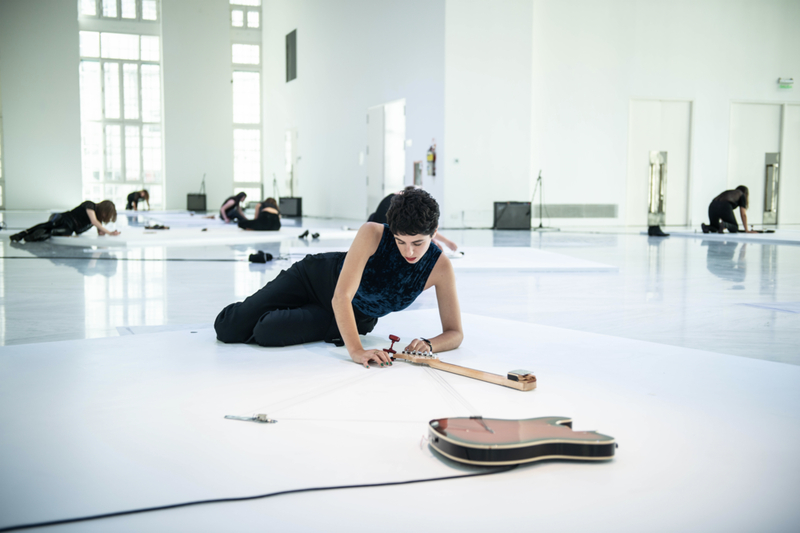 In Untitled (Babies), Naama plays on stage with her all-female band when, what at first appears to be an attempt to smash the guitar becomes instead a tiring, back-breaking exercise and durational performance that leaves the monolithic guitar entirely intact, while the floor now in shreds becomes a gaping void. Melodies of Certain Damage (Opus 2) is perhaps her response to this initial proposition. 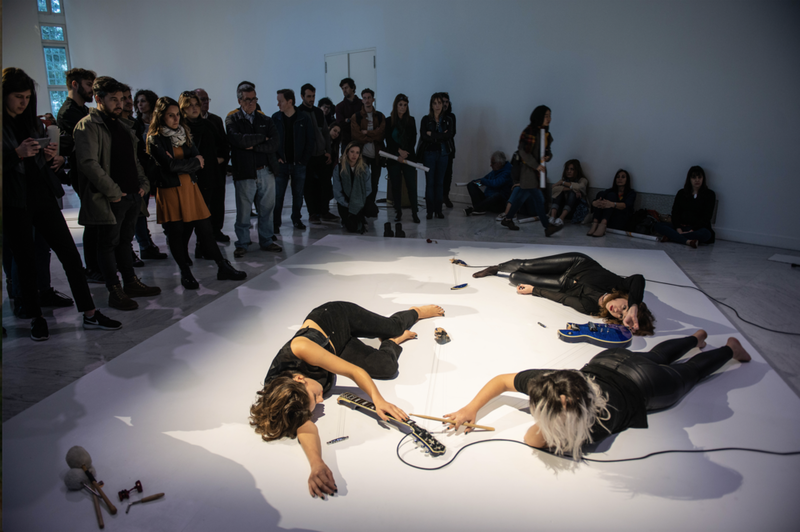 The composition is a collaborative piece by women and gender nonconforming musicians and performers— some of whom have worked with Tsabar previously, others new collaborators from Buenos Aires— that is created here on site during a one-week residency. 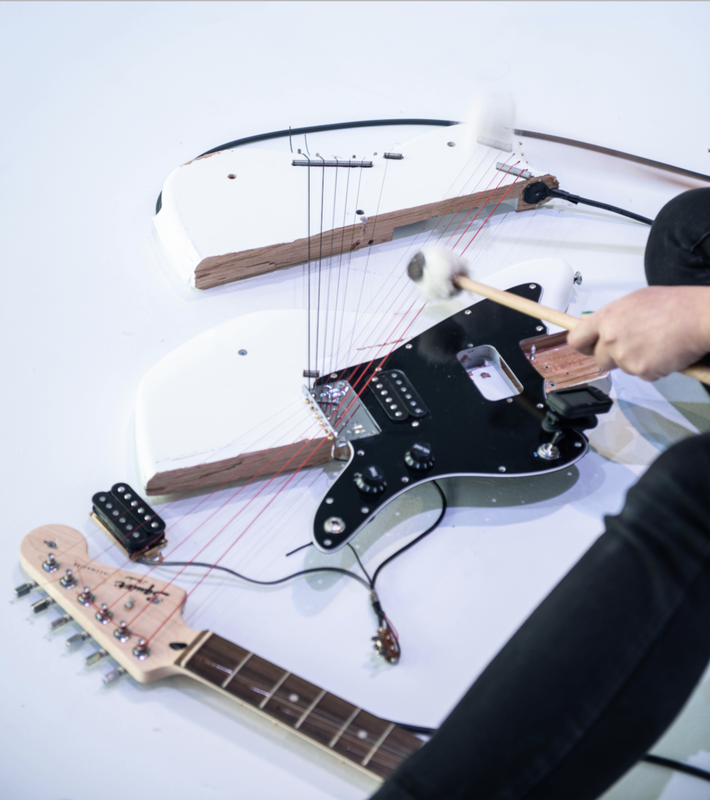 These instruments have no masters, no teachers, they come with no rules for how to play them and each performer brings her own particular musical history and training. The sensuality with which the women play these instruments, laying with them in a kind of post- coital intimacy on the floor, gives the works their new lives. What might be seen as a position of servitude or vulnerability on the floor for the performer, becomes a position of empowerment both with the objects and other performers. Tsabar’s refusal to engage with the monumentality of the Faena Art Center is a transgressive act that shifts the gaze and ultimately our understanding of the lines of power—a decolonizing of the ground beneath us, that necessitates a re-evaluation of traditional performance hierarchy in a way that is less centric, more amorphous and dispersed – towards a new disorder. Composed in collaboration with Gabriela Areal, Rose Blanshei, Florencia Curci, Violeta García, Luciana Rizzo, Natalia Spiner, Sarah Strauss Naama Tsabar and Carola Zelaschi. At Faena Art Center Buenos Aires, 2018. Images courtesy of Faena Art.